I was totally not expecting the MAC Rose Romance line to arrive in Hong Kong so soon, but today I passed by one of their shops and there it was! I got the Beauty Powder in "Summer Rose"(Soft violet pink with pearl) and the Lustre Lipstick in "A Rose Romance" (Mid-tone pink with gold pearl). 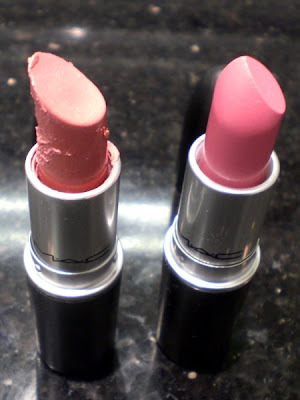 Here is the new lipstick on the right, with my poor mangled "Angel" on the left (it melted in my pocket on a hot day =___=). 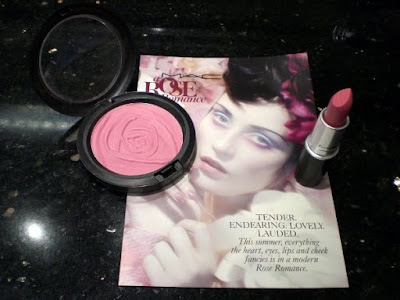 I put them together because at the shop I was debating whether I should get "A Rose Romance" as I already got a muted pink Lustre lipstick. 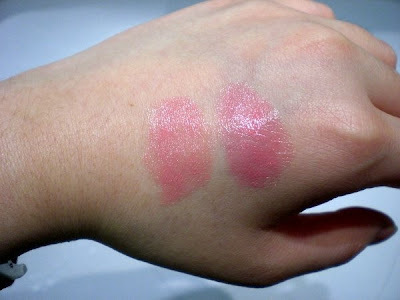 Here I swatched them side by side, with "Angel" on the left and "A Rose Romance" on the left. I did the same at the shop and decided that they look different enough ("Angel" is more peachy while "A Rose Romance" is more violet) so I got the lippie. And here is the "Summer Rose" beauty powder on my cheek, on top of Everyday Minerals Intensive Foundation in "Fairly Light" (I am a ghost, I know :p). I was afraid that the Beauty Powder won't show on my face as it is so sheer, but with the first dusting I can already see a bit of color, and after the second dusting it looks like any other blush I have. My skin's slight golden tone mixed with the violet in the BP to give a true-pink color on my cheek, which I really love, and is also why I bought "Summer Rose" instead of "A Blush Of Youth" since I think that one is too run-of-the-mill pink. By the way, I am wearing Maybelline's Impact Express Smooth Pencil Shadow in lilac, a no-brand grey pencil liner, and Kiss Me Heroine Make Volume and Curl Mascara on my eye, and my contacts are Hypersize Platinum Brown. The Pencil Shadow tend to crease a bit if I don't use a shadow base, but it does stay put all day and won't come off even with some rubbing.